Frank R. DePaola DDS & Associates at Maxwell Place are committed to providing a unique patient experience based on relationship building, a high standard of care, and our uncompromising commitment to excellence. Over the years, we have developed a reputation for delivering exceptional dental care to patients of all ages that improve both the function and aesthetics of their smile. We improve the lives of our patients while building meaningful relationships. To learn more about the services we offer, please call 201-792-9400 today to schedule a consultation with one of our Hoboken cosmetic dentists. When you come to our Hoboken dental practice, you will receive world class care with a focus on your comfort and safety. Our dentists create optimum health and wellness through a comprehensive diagnosis, meticulous treatment planning, and through our endless commitment to education and training. Continuing education is a huge priority at our practice. 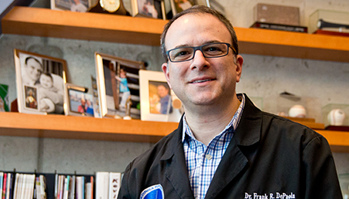 Dr. Frank completes approximately 100 hours a year of continuing education training, vastly exceeding the 20 hours a year recommended by state guidelines. He has earned his fellowship from the Academy of General Dentistry and is currently in the process of receiving a fellowship at the Las Vegas Institute of Advanced Dental Studies (LVI), the premier neuromuscular and cosmetic dentistry training institution in the country. Dr. Frank is also a clinical instructor for DNA Orthodontics, where he teaches other dentists how to use this revolutionary orthodontic technology. Everyone at our office, including hygienists and assistants, receives extensive training on a yearly basis. The entire practice collectively spends more than 200 hours a year on continuing education training. This is a major part of our commitment to excellence, and it ensures that your treatments will be performed according to the latest and most advanced techniques in the field. In 2009, our family dentistry services became more extensive when we brought a pediatric specialist, Dr. Jennifer Paik, on board our talented team. We are proud to be the first dental practice in Hoboken to have Board-Certified Pediatric Dentists on staff. You can enjoy piece of mind knowing that we have a skilled pediatric dentist available to address your children’s oral health issues whenever they arise. 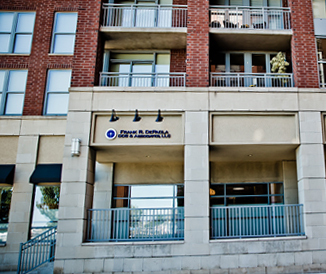 Our state-of-the-art Hoboken dental office provides excellent care in a comfortable environment. We use electric hand pieces which provide quieter, vibration-free treatment. We also employ a computerized delivery of anesthetic with a special wand, eliminating the use of needles in order to provide a more comfortable experience. While you are receiving your treatment, you can listen to your iPod or watch TV to make the time pass more enjoyably. Blankets and pillows will be provided for your comfort, and OraVerse is used to eliminate any unwanted lingering numbness affects following your procedure. Please contact The Pratice at Maxwell Place using the form on the right side of the page or call 201-792-9400 today to schedule your initial appointment or to learn more about our dental team. Dr. Frank DePaola serves patients from Hoboken, Jersey City, and throughout Hudson County, New Jersey.